If you’re like me and watched from a distance leaked builds of Windows 7 fly past like water balloons in a water balloon fight, then the time to join the fun is now. The highly anticipated release candidate (RC) build of Windows 7 has been leaked and its authenticity is entirely undisputed. First looks reveal nothing significantly new or different, but if you’ve been wanting to get a vibe of how far Windows 7 has come since the public beta, especially performance, this is the build to get. For those of you who want to play along at home, pay your favorite “content hub” a visit. The full build string is “7100.0.090421-1700” and the x86 (32-bit) ISO coming in at a easily manageable 2.35GB (2,530,975,744 bytes). Furthermore to check if your file has been tampered with, you can easily compare the file hash of your x86 (32-bit) ISO file with HashTab against the following. Tip: Those who have a portable USB hard drive can follow my simple guide to making a super-handy bootable USB Windows 7 install drive. With this, I installed Windows 7 RC in around 10 minutes. Update: If you’re not feeling that adventurous, prepare to grab this RC build on May 5 when it’ll be publically available. Or if you’re lucky enough to have a MSDN/TechNet subscription, from April 30. In the meantime you can get yourself a legitimate Windows 7 Beta CD-Key (which is valid for RC) from the Microsoft website if you don’t have one already. me cant find it on the interwebs anywhere =( .. first post yay i guess. Is that means that build was approved to be an official RC? Is there a possible way to install Windows 7 on a USB drive ? I stress the “on” (not “from”) ! @Fahd: A couple months ago I spent a whole day trying to get Windows 7 to install to a USB. I got as far as the boot splash screen but it never actually booted. Somewhere during the boot process it fails. Can you install Windows 7 on a system that does not have SP1 installed? Awesome one. Looks so clean. Any big noticeable changes since 7077? @miretank: I didn’t download/install 7077 myself and only browsed screenshot galleries, but as far as I can tell nothing on the surface has changed. Notable chane in Windows 7 from 7077 etc ? Do you\anyone have the hash of the x64 iso? So it looks like Paul Thurrott was wrong – there was no new UI to be introduced in RC builds. Looks the same to me. He might not be wrong yet. It will be in the RTM branch, NOT the RC fork. This is build 7100 (RC) – Its been out of date for a bit already. Paul even on his site has screenshots of 7106. So don’t expect the new UI in the old RC build. Anyway, just to make it clear, i’m not saying there will be anything new in the UI. But you can’t say that its not true yet, coz you guys miss read what he was saying. But anyone with half a brain will figure out that theres no gonna be any OMFG changes in the UI as they have spent ages doing tiny tweaks to the interface as the builds have been progressing. Which you just wouldn’t do if you were gonna replace it. Awesome! A new build to play with. I can’t wait to download it. Also, where did you get the wallpaper in the screenshot? Is there anyway to get it? It looks really nice. Whice is newer right now? @Long: Ah, I knew I recognised that road! I remember going over it once by mistake (my e-TAG was only valid up to the Flemington exit 😛 No fines, fortunately…). When you talk about performance, how significant of a difference is it from previous builds? @RF: The only comparison I can make from the same hardware I’ve installed it to is with the beta 7000 build, and from that performance is obviously much improved. However I’ve seen reports that people has been enjoying improved performance since build 7077 so I don’t think there is much difference between this RC and recently leaked builds. let it be known, that I, Darren Kopp, offically declare that from now on, releases like this will be designated as Leaked To Bitorrent (LTB). you switched the 35 and the 53 in the 2.35 and 2.530… numbers! Please correct this immediately in order to satisfy my hunger for hamsters. You know what keeps your site running. @Long: To be pedantic, 2,530,975,744 bytes would be 2.35 gibibytes, and 2.53 gigabytes. Pingback: Durchgesickert: Windows 7 Release Candidate bereits im Netz | TechFieber | Hot Gadget Blog. Smart Tech News. Hey Long! Thanks for the checksums… it made my day. Hey Long, have heard anything about UI changes coming to 7 or is this it? If there are no changes, I wonder what the so called surprises are that Microsoft is holding back. If you are not under NDA any guesses? I’m quite disappointed Microsoft ignored such a highly ranked win7taskforce request and trivial matter like updating all the old icons littered about windows some going as far back as win95. All the oldies are still there seriously I would love to hear the MS reason on a release were the focus was fit & finish that something like this was decided not worth doing. The higher the number, the higher the build. The higher the number, the newer the build. @insomniac, i agree with your assessment. I think there is nothing wrong with excluding certain features from RC build, public testing. If, and it is a big if, there are any new features I doubt it would alter the existing functionality of the RC build. It would likely be an additive feature and tested via a private test group. For example, if Microsoft wanted to deliver some new experiences in Media Center. In that scenario, there is no back compatibility testing needed…so the risk is minimized. And if the feature fails private testing, then that you don’t get alot of backlash for not including something that no one knew about to begin with. Hey, maybe they are gonna re-release windows Dreamscene! Hahaha jokes. 7100 is newer than 7106, why? Because 7100 was reserved for whatever build became the RC, so 7100 is newer than 7106. 7100 was compiled on the 21st April. My understanding what that they did a fair bit of internal testing for the RC release. But still carried on compiling after it. Though i overlooked that build string. As it was compiled on the 21st. However, as i said before, there is a RTM branch going on. Microsoft have for some reason forked the builds (which is something they sort of said they didn’t need to anymore). If your hashes are from the torrented version, you simply cannot safely assume it has not been tampered with. Rather, you would be more sane to assume it has been tampered with – until you can verify these hashes with someone from the source (ie Microsoft). Windows 7 is shaping up to be the biggest disaster in Microsoft history. The smart money says wait for Vista Ultimate SP2. Stay away from that white elephant known as Windows 7. *I* for one am going to wait until the build is released officially, as far as i can tell, there isn’t a downside to waiting. I suppose It’s possible that a new UI will be introduced into the RTM build but it seems unlikely Microsoft would fly that out the hanger without any large-scale (external) testing. When Whistler was cooking in Microsoft’s stew pot the final UI (Luna) was introduced in the final beta, just prior to the RC stage. Before that XP looked nothing like it did upon release, using a never-to-be-seen-again theme called Watercolor. But, I guess we’ll see what we see. Is it legal to use this build? I mean … shouldn’t we wait for the official release (5 may) or it’s ok too? @asdkingh Legal? Technically no..but Microsoft would not sue someone over using a leaked build. They need this, it creates hype. This is legit… you can download a ZIP file of fifty screenshots of this build: 7100 screenshots. Unless it is not very possible/easy to modify every single piece of software within the RC to show build 7100 to fake it, I’m still worried. Perhaps the “UI” is already included, just disabled, like every other “disabled” UI in beta/rc versions of Windows. Pingback: Windows 7 RC Trapela Sulla Rete Torrent! Pingback: Secret new option in Windows 7? It’s Windows XP! duh, where is the link to download?? Can I upgrade from build 7000 to RC1? I’d rather not do a complete reinstall but I am having no luck trying to upgrade. It’s probably ridiculous to ask this, but can I upgrade to 7077 and then upgrade to RC1? Or should I just take the time to reinstall altogether? Anyone have any experience trying to upgrade a vista install with win7? Guess you’re too young to remember Windows Me then…. Let alone MS OS/2 1.x, Windows 286, MS Works for Windows…. I could go on…..
Yay I got the ISO! Copy the ISO contents to a folder on your hard drive. Go into the sources folder there and right-click on cversion.ini and choose edit. Change the 7077.0 to 7000.0. Then install from the hard drive folder. didn’t give in to download one of those leaked versions on the interweb but instead managed to get the official public RC2 release today. – It works as quickly as Windows XP inside a virtual machine. – Many things have been re-arranged to make easier accessible… eg: Screen resolution is now a right click away. – how in gods name Microsoft continuously manages make simple things so convoluted is beyond me. I think Windows 7 in essencene has almost exactly the same feature of OSX (not including the iLife suite) to serve as a basic tool box for day to day computer work. Yet Microsoft still manages to make everything so convoluted it’s actually quite amazing. Just take a look at the Start Menu. There just doesn’t seem to be much logic behind what’s listed on the left hand side (various programs) and on the right hand side (various programs, docs, config screens). – I have spent about 30 minutes trying to figure out were IIS is. Turns out it wasn’t installed by default. No problem. However, after installation I now don’t seem to be able to find were the bloody IIS console is. I actually know it’s called the IIS console yet I still can’t find it. Tried to type in help and still no luck??? What’s worse after typing “IIS console” in the help search box it tells me to check my spelling. It it too much too ask to make things simple? – While Windows 7 is a huge improvement over Vista it does seem like Vista really just a Beta version. I actually went out and spend money on a full version of Vista Ultimate. In many ways I feel cheated. Microsoft never delivered on the Ultimate promises and Vista was plagued by so many problems I went back to Windows XP. Now I am expected to fork out more money for a new version that essentially is what Vista should have been come… do they really think I am that stupid? – Multiple versions of Windows 7? WTF, haven’t you guys learnt anything? Just do one version, sell it at the same price as OSX and this baby blossom. Am I the only one that find Windows 7 RC has important bugs? * Moving pined items up/down in the Start Menu, can make the the recent program list disappear all by itself. * Browsing item by item in the Control Panel can result to an error in the panel “failed to load”, and then Windows Explorer stop responding. * Start Menu search can’t find panels added by drivers (sound card/video card), however it works when looking for other things, and within the Control Panel window search bar. * XP Mode is not as advertise 100% compatibility, as when you run software that require input other then keyboard/mouse (ie: microphone), it can’t use it, which render the software useless. * Help icon in the mobility panel (Win+X) is still from Windows XP. * Char Map text in the status bar is not aligned properly vertically. * Windows Journal.. oh boy… most icons are badly drawn, and the “zoom page” drop down box is miss aligned going over a line separator. * “Phone and Modem” Control Panel, dates since Windows 95. It’s not even using Aero buttons. * Blurry Recycle bin icon in the right click menu on the recycle bin icon (when enabled). * Disk loading cursor dates from Windows 95. * Using Windows Standard theme, the crumb-bar (address bar) section are smaller then there field. * Using Windows Standard theme, on the start menu, the blue cancel (X) button that appears next to the search bar when you perform a search is smaller than the search icon. * Tool tip on “Minimize”, “Maximize/Restore”, and “Close” buttons on windows is still using Classic Windows style. You know on the Start Menu, you have 2 items Windows Media Player 12, and Sticky Notes, where it can open up to the left of the start menu to offer some quick actions.. well this is totally incomplete, making it useless. Look at Sticky note, you have “New Note”… that’s it. What is the point? That is what it does by default when you click on the “Sticky Note”. How about show the list of notes written down? For Windows Media Player 12, why not have my playlists, and/or “play video” and “play DVD” when a DVD movie is inserted? Anything to make it useful. – No, you got what you paid for. If you did not like it, then it’s your problem for not trying out the trial version of Vista. If you find your self cheated, Windows XP, which is the “should have been of Windows 2000”, came out about 1 YEAR after. Now that IS bad. Windows 98 is the “should have been of Windows 95”. It’s always like this (except for Win ME). The first version places the foundations, the second fortify, optimized the foundation and develop on it. Windows 9 will be the “should have been of Windows 8”. You did not get Vista for it’s feature, consider yourself to have so many new things. Windows XP kernel is based on Win2000, which is based on WinNT4, which is based on the 1993 WinNT3, before the internet. Wonder why a 8 year old kid can make a virus under XP? well that is why. Security was kinda the last thing Microsoft had in mind when making NT3. XP is a pile of patches over NT3, so bad that form what I see in XP, I don’t even think the developers found themselves in the code. Vista was desperately needed. – Multiple versions of Windows Vista/7… OOHHHHH you mean like Windows XP? 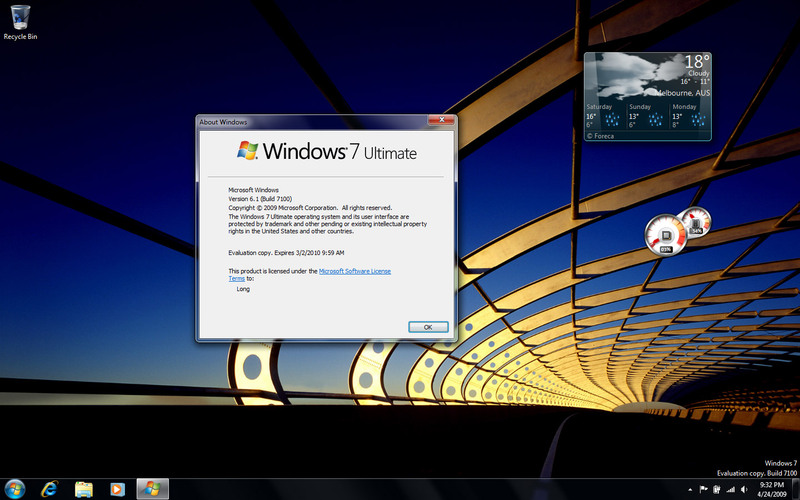 TO ALL OF YOU WHO THINK WINDOWS 7 IS FAKE, WINDOWS 7 IS NOT FAKE! MY COMPUTER TEACHER IS ONE OF THE TESTERS! HE SAID WINDOWS 7 IS WAY BETTER ALREADY THEN VISTA. AND 7 JUST CAME OUT!!!!!! I WOULD TOTALLY RECOMMEND 7!!! !